Department of Mechanical Engineering perceives to be a leading department disseminating quality and globally acceptable education based on innovation and academic excellence. Department of Mechanical Engineering strives to disseminate technical knowledge to its students to meet intellectual and career challenges for sustainable growth of humanity. PEO I: Graduates will be able to pursue successful professional career in Mechanical Engineering with sound technical and managerial capabilities. PEO II: Graduates will have skills and knowledge to formulate, analyze and solve complicated problems to meet global challenges. PEO III: Continuously updating themselves in areas and technologies that are relevant to their career, participate in personal development and increasing their understanding of matters that are current and important to society at national and international levels. 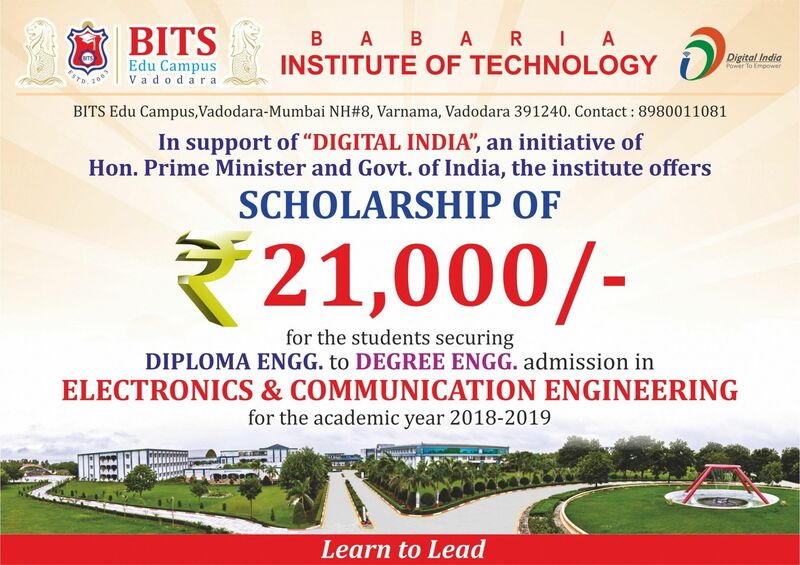 Babaria Institute of Technology, at BITS Edu Campus was established in 2004 and Department of Mechanical Engineering is a part of the Institute. Mechanical engineering is an engineering discipline that involves application of principles of analysis, design, manufacturing and maintenance. 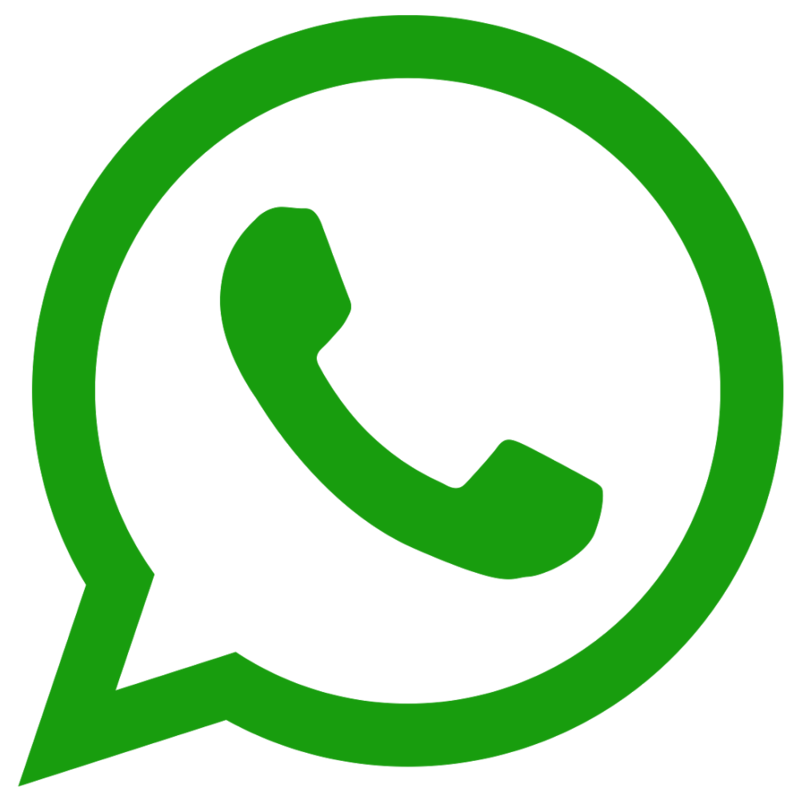 It is one of the oldest and most essential branches of engineering. Students are trained in areas of production, industrial engineering, refrigeration and air-conditioning etc. CAD/CAM courses assist students in designing components with greatest possible efficiency. The comprehensive course curriculum and intensive practical training enables students to take on challenges of broad ranging roles in various departments across wide spectrum of industries. The department came into existence in 2004 and now has an intake of 180 students. The department has well equipped laboratories and experienced and dedicated faculty who cater to the all-round development of students. Department started developing strong links with industries and academic institutions like NITs and IITs. Apart from high quality teaching at U G level and P.G level, department is actively involved in Basic and Applied Research. The Department of Mechanical Engineering offers B.E. and M.E (Advanced Manufacturing Technology). Department arranges various industrial visits and invites expert talks as a part of interaction with industry and also organizes Seminars / Symposia for professional interaction. The Department contributes to the interdisciplinary academic and research activity of the institute. 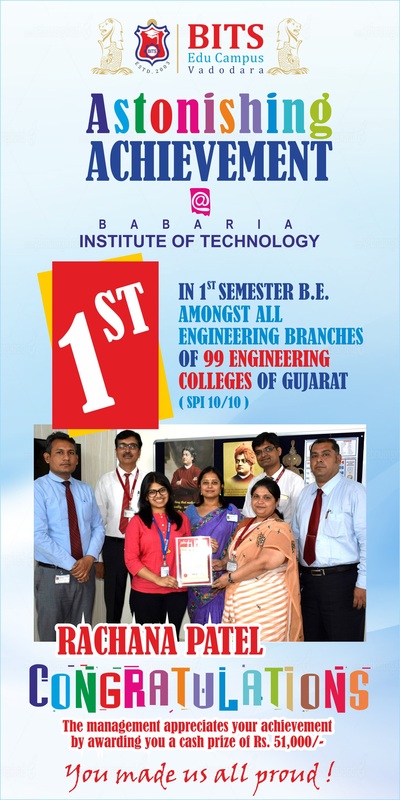 Why Mechanical Engineering @Babaria Institute of Technology ? In order to cope with the global requirements the institute provides the latest facilities to the students such as MM Class Rooms (Higher Semester), Networking of Class Rooms with electronic database and MM Theaters for conferencing. The building has well equipped laboratories to conduct experimental works. All the lecture halls are well ventilated and to be provided with latest teaching aids like multimedia-overhead projectors along with the black boards. During two day GUJCOST sponsored workshop at BitsEducampus, Dr Vishvesh Badheka (Professor, PDPU) was invited as a speaker of one of the sessions of the workshop. His kind cooperation and motivation energized our PG students and permitted us to visit different laboratories and facilities at PDPU. He also invited our students with one faculty to attend a young professional seminar at free of cost. Four numbers of PG final year students and one faculty member named Raybahadursinh Chauhan (Department of Mechanical Enggineering). Pandit Deendayal Petroleum University had organized a seminar on “Young Professional Seminar” in Association with IIW INDIA. Session 2 Mr. Hardik Vyas Overview of SS to Al dissimilar metal joining. Session 3 Ms. Deepika Harwani Super plasticity in Mg alloys. All the speakers had delivered the talk on latest technology used in various welding process. The topic was well explained to all the participants. Open the door for the widen thinking. It will be benefited for the upcoming batches in the PG program. We take this opportunity to thank the Head of Mechanical Engineering Department, Principal of Technology and management of BITS Edu Campus to permit us for a visit. GUJCOST sponsored Two Day Workshop on ‘Recent Trends in Mechanical Engineering’. Mechanical Engineering Department of Babaria Institute of Technology organized a GUJCOST sponsored Two Day Workshop on ‘Recent Trends in Mechanical Engineering’ on 3rd and 4th January, 2019. More than 40 faculty members participated in the workshop. The main objective of this workshop was to spread the knowledge of recent technologies in Mechanical Engineering field. The program covered topics related to advances in surface engineering, optimization techniques, manufacturing processes and welding technologies. Expert speakers from reputed institutions were invited to share their knowledge and expertise in this program. The program enhanced technical knowledge and provided new insights to faculties in different areas. For the inaugural function of the workshop, Mr. Darshan Shukla, Sr. Deputy General Manager, L & T Power was invited along with Dr. Mukesh Bulsara, Associate Professor, G. H. Patel College of Engineering & Technology.